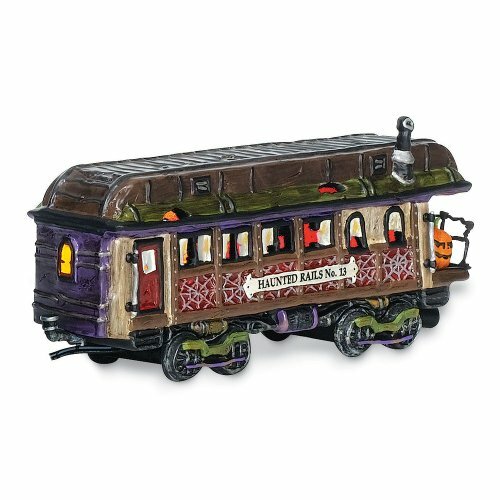 Department 56 Snow Village Halloween Haunted Rails Dining Car Accessory Figurine by Department 56 at Two Clock. SKU: H025FIG009. MPN: 805677. Hurry! Limited time offer. Offer valid only while supplies last. On holidays, special days, or every day, avid collectors and beginners enjoy decorating with miniature pieces from the Snow Village Halloween series. On holidays, special days, or every day, avid collectors and beginners enjoy decorating with miniature pieces from the Snow Village Halloween series. Frightfully fun and painstakingly detailed, the haunts of the Halloween Village will give shivers of excitement. Add some spooky accessories and your Halloween will take on a life all its own. Second in a continuing series of railroad cars to coordinate with "Rickety Railroad Station," the Haunted Rails No. 13 Dining Car dares only the bravest of passengers to enter. Broken out windows, tattered curtains, and the dilapidated railings give indication to the type of meal served inside. Like the coordinating engine, this car also includes a lit spooky jack-o-lantern. Spider web detailing sculpted into the side of the car adds scary flair. Lit with LED lights, the dining car includes a small power cord that conveniently connects to "Haunted Rails Engine and Coal Car." The power jack on the back end will accommodate the power cord from the next car, introduced in 2010. The dining car includes the Snow Village Halloween 10th Anniversary stamp on bottom. The car measures 9-1/4 by 2-3/4 by 4-1/4 inches. It was introduced in December, 2008, and is retiring in December, 2011. IMPORTANT: Because it is intended to plug into the Engine, no power cord is included with the Dining Car. The intricately detailed pieces of the Snow Village Halloween series are as unique and diverse as the regions that inspired them. The exquisitely crafted collection allows individuals to showcase a little world in a way that reflects personal style, expresses creativity, and brings delight to all who see it.